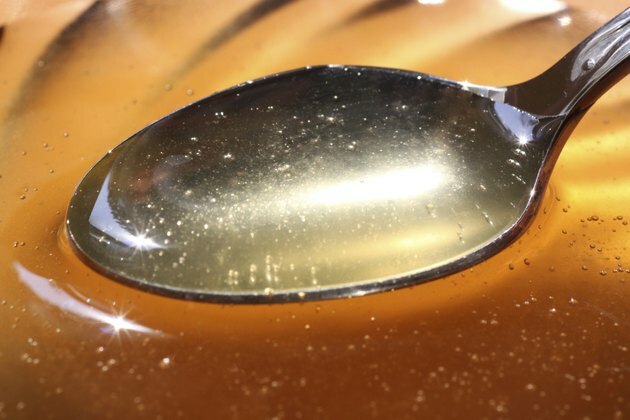 How Many Calories in a Teaspoon of Honey? Honey is a naturally occurring sweetener produced by bees. The bees collect nectar from flowers, regurgitate it, then store the liquid within wax cells in their hive. From there, they dehydrate it to form the thick, sugary syrup called honey. While honey may be a natural product, it is still a calorie-rich sugary substance. A 1-teaspoon serving of pure honey contains 21 calories, almost all of which comes from carbohydrates in the form of sugar. This measure of honey also contains a trace amount of protein. A 1-teaspoon serving of honey contributes just over 1 percent of the intake of calories recommended for the average adult within a typical 2,000-calorie-per-day diet. A 1-teaspoon serving of honey weighs about 7 grams. Around 5.7 grams of this weight are carbohydrates, while 0.02 grams are protein and the rest is water. While you may consider honey to be more nutritious than table sugar, it is still sugar and should therefore be eaten in moderation. Added dietary sugar can adversely influence nutritional deficiencies, tooth decay, childhood hyperactivity, diabetes, obesity and heart disease.